Alex Hitchcock, Dave Robinson (tenor saxophone); Jack Courtney, Rob Smith (trumpet); Tom Green, Vijay Prakash (trombone); John Caddick (sousaphone); Harpal Mudhar (drums); Fred Harper (percussion). 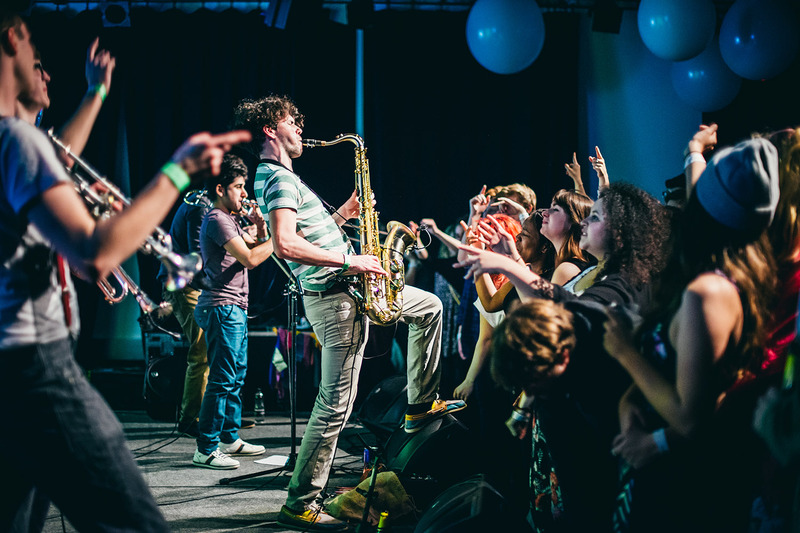 In England, the eight-piece band The Brass Funkeys (formed in 2011) have already played at prestigious festivals including Glastonbury and the Cambridge International Jazz Festival. In addition, this brass band has supported famous acts like Dr. John and The Dirty Dozen. The Brass Funkeys is a London-based group consisting of highly talented musicians. The band draws heavily on the musical traditions of New Orleans. The musicians display their skills, rolling from spirited second line revelry to soulful jazz funeral marches and brass-driven funk. And they don't shy away from adding a dose of modernity to their eclectic live show by introducing reggae, hip hop, gypsy, swing, and Latin influences. Watch out for this exciting band's unique interpretations of The Jungle Book classic I Wanna Be Like You and Rage Against The Machine’s Killing In The Name.